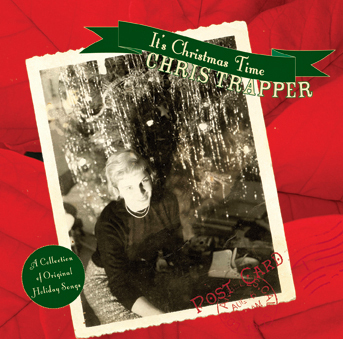 Don't forget, I have a Christmas record of all original Holiday songs. If you're sick of Jingle Bells go ahead and break out my album, until you get sick of it too. So I was playing a gig at Club Passim in Boston a little over a month ago, opening for an artist named Cheryl Wheeler. I don't normally open in Boston, as it's my home base, and I draw pretty well there consistently. But this gig presented a unique opportunity because I could make a few new fans and a little cash, also learn a few tricks from a great seasoned pro by watching Cheryl's set, and I was thinking my core audience would be deterred by the “much higher than mine" ticket price tag on the show. So it would be no harm, no foul. None of my people would show up. After my fairly mediocre set I took my seat in the club awaiting Cheryl's set. Two lovely women in their early 30's, dressed quite glamorously in contrast to the earthy decor of Club Passim, approached me and said, "We're your biggest fans!” Immediately, my brain kicked into gear. I've seen most of my "biggest fans" and I didn’t recognize these two from anywhere. Then I had guilty thoughts as they had just paid fifty bucks each to see me play a 30-minute set. "The last time we saw you was 10 years ago in Phoenix.” Ten years ago? Biggest fan? It didn't compute. "You do realize I've been playing all the time, everywhere, for the past 10 years?" "Oh you have? Well, we had kids, moved around the country, etc." To them, they were very big fans -- of recorded music. Live music had become less of a priority. Suddenly it occurred to me, not everyone is going to see my music the same way I do: (Duh!) as essential, all encompassing, can't sleep at night because it's so crucial, type of material. I suppose for most, music is a secondary thought. It is something to listen to while getting dressed or while driving somewhere. Something supplemental. But there is another type of person. And I say this from me, and all of my friends who are musicians. There are those who live and die for it. They drive for it, they fly for it, and they shut the TV off and get high from it. They write about it, they set up chairs and volunteer for it. They record it, they mix it, they shoot film to it, and they dance, even though their feet hurt, to it. Eventually, they kick off their shoes to it. They pay their last dime for it. And they cry to it. So this note is for those regulars, the regulars us musical bartenders love seeing on our stints through town. Because I know in my own life, most of my friends with kids or mortgages see one or two concerts a year. So to us musicians, the regulars become all the more important with each passing year. I have been graced by the presence of many regulars, people who see me twice a year, every year, at least. And I guess I just wanted to say I like it, and thanks. A friend of mine in San Diego sent me an article last week about a radio host in Canada who had recently gotten himself into a heap of trouble. I had no idea why they had sent me this link, then I opened it and suddenly memories flooded back. I recognized the guy's name. In or around 1998, my band, the Push Stars, drove from Boston to Rochester, NY to open for a Canadian band called Moxy Fruvous at the Rochester Institute of Technology (RIT). We didn't know the band, but someone who worked for us convinced us it would be good to do, due to cross border traffic, and the healthy college following the band brought with them. But opening for a band you didn't know could be a scary proposition. What if they were dicks? For those of you who never knew the Push Stars, If anything, me and my band mates were too nice, and would often opt out of a conflict in the hopes that Karma would step in for us at a later date, as we'd surely get hugely popular, while said offending band would wallow away in obscurity. Could we move the drum kit back just a few feet? On a side note, before I go into full attack mode, I should explain that refusing to move gear is a common occurrence in the band world. There are all sorts of reasons for it. Some more valid than others. Mainly, the soundman does not want mix levels to change after microphones have been delicately placed. Maybe they're a little lazy, and don't want to make notes, or lay a few pieces of tape on the floor to recall placement/settings. The less valid reasons can be summed up by the headliner needing to exert its power by belittling the opening band and making them look insignificant. The truth is probably somewhere in between, and the significance is water under the bridge. Although bands will certainly make decisions on their own, they will send a crew guy to be the bad cop messenger to your crew guy, similar to two lawyers bouncing between a divorcing couple. I was swift enough to understand where the decision NOT to move this huge, bulky, distracting obstacle was coming from, so I decided to go speak to him myself, mano a mano. Maybe there's a compromise we can reach? Could we move the drum kit back just a few feet? What a liar, I thought to myself, but knowing musicians to typically be kind of beautiful, gentle people at their core, I gave him the benefit of the doubt and asked again, at which point he shrugged me off and redirected me to his tour manager (who had already denied me). Wow, can you seriously be that lame as to treat a fellow musician that way? I thought. We're all part of the same club, fighting the good fight against the establishment. If you have a good reason for doing what you're doing then tell me and I'll try to understand. Not this guy, to me, at that time, he was worse than the establishment. He was a traitor. Cold. I didn't mind the outcome as much as the attitude. Now I know you can't sum a human being up so simply, yet I do believe our smallest actions reveal our spiritual center, and our instincts are our true God. I kept wondering when Karma might show up. If you don't have time, just know that some people get brought down to earth.